Originally from upstate New York, Jillian Gardner currently resides in Waco, Texas, where she is finishing her studies at Baylor University in the Artist Diploma program studying with Dr. Isabelle Demers. She began her study of the organ at age fourteen with Stephen Best of Utica, New York, and completed a bachelor's degree in Organ Performance with a minor in historical performance from the Oberlin Conservatory in May, 2015, working with Jack Mitchener, James David Christie, Marie-Louise Langlais, and Webb Wiggins. In May 2017, she completed her Master’s degree in Organ Performance with Dr. Isabelle Demers at Baylor University in Waco, Texas. Gardner has been an active recitalist across the United States and United Kingdom. She was a featured artist at the 2014 and 2017 Organ Historical Society Conventions in Syracuse, NY and Minneapolis, MN. She has also performed at St. Thomas 5th Avenue (NYC), Fourth Presbyterian Church (Chicago), Methuen Memorial Music Hall (Methuen, MA), Trinity Episcopal Cathedral (Phoenix), St. Patrick’s Cathedral (NYC), Cathedral of St. John the Divine (NYC), St. Joseph's Cathedral (Hartford, CT), St. Mary's Cathedral (San Francisco), and University Baptist Church (Austin, TX), amongst others. In July 2016, she gave a tour of recitals at Chester, Coventry, Truro, and Liverpool Metropolitan Cathedrals in the United Kingdom and in May 2018 recitals at St. Paul Cathedral (London), St. George’s Hanover Square (London), and St. Mary Redcliffe Church (Bristol). No stranger to the competition circuit, Gardner took first place in the chapter level competition of the Regional Competition for Young Organists (RCYO) in Buffalo, New York in March 2013. The next year, she finished first at the Tuesday Musical Club Association scholarship competition in Akron, Ohio. In March 2015, Gardner won the RCYO chapter level competition again, this time in Albany, New York. 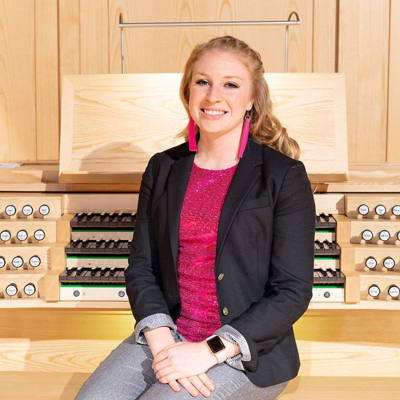 During the same month, The Diapason magazine selected her into the first class of one of the top "20 under 30" organists in the nation, which recognizes individuals under age 30 who have made significant contributions to the fields of organ performance, harpsichord and church music. In April 2015, she was a finalist in the Arthur Poister competition in Syracuse, New York and in June 2017 she received second prize in the Québec organ competition in Québec, Canada. In addition to performing and competing, Gardner has worked as the organ scholar at St. Peter's Lutheran Church in New York City in January 2015. She has also been organist at St. Joseph's Church, Lee Center, New York, Grace Lutheran Church, Oberlin, Ohio, and St. John's Episcopal Church, Oneida, New York. She is currently the Director of Music and Organist at Austin Avenue United Methodist Church in Waco, Texas, where she oversees the music program and directs the adult Chancel Choir and Handbell ensemble. She has twice attended the McGill Summer Organ Academy in Montréal, Canada (2013, 2015) where she studied with Olivier Latry, Hank Knox, and Hans-Ola Ericsson. She has served on the Southwest region’s committee for the AGO Young Organists (AGOYO) and currently serves as the National Convener for AGOYO and is also the Dean of the Baylor Chapter of the AGO. Passionate about making the organ accessible to as many people as possible, Gardner's diverse programs and signature pink organ shoes brighten each of her colorful performances. Outside of the organ loft, Gardner is an advocate of physical fitness. She believes that a healthy mind and body contribute to the quality of her artistry. Gardner always enjoys meeting new people and is enthusiastic to travel and experience different cultures in the United States and abroad as she pursues a combined career as a church organist, teacher, and recitalist.